NEW: Updated in October 2014I am very pleased to release this newly updated version of my best-selling book. 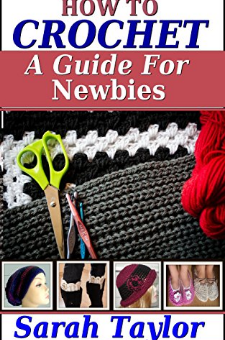 I read all of the customer reviews on my books and appreciate everyone who takes the time to give their feedback; your comments have helped me to see where improvements and clarifications needed to be made, and I am very thankful for your input.This book shows you how to do all of the basic crochet stitches with detailed instructions and step-by-step illustrations. You will easily progress from complete beginner to being able to crochet any of the projects in this book, and beyond!This latest edition includes the instructions for four of my best-selling crochet patterns:-Boot CuffsSlouchy HatHouse SlippersCloche Hatin addition to the quick and easy original patterns for a spa-style wash cloth, mesh scarf, Kindle cover, flower head band, and a basic granny square motif which can be used as a basis for many other projects such as afghans, cot covers, cushion covers........the possibilities are endless! This is the ONLY beginner's book you will need.Scroll up to the top and click on the link to "Buy Now" to deliver almost instantly to your Kindle or other reading device, and make a start on this wonderful craft TODAY.